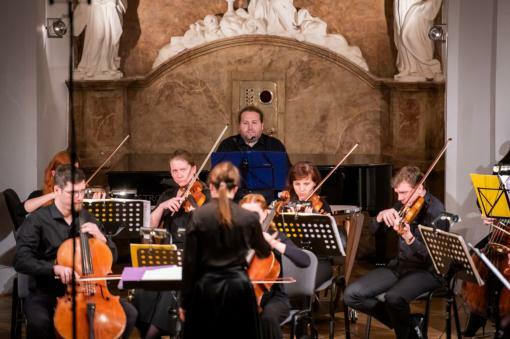 Evenings of the cycle named Music Stocktaking of the Brno-based orchestra Ensemble Opera Diversa regularly bring to light various half-forgotten works by Czech composers. 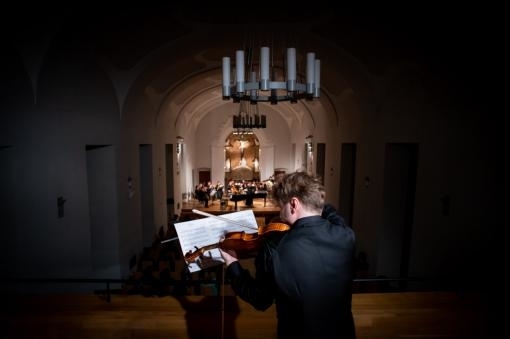 This Tuesday's concert in the concert hall of the Convent of Merciful Brother [Konvent Milosrdných bratří] became a commemorative tribute to the anniversary of the tragic years 1939 and 1969. Violinist Milan Paľa and pianists Kristýna Znamenáčková and Lucie Pokorná performed alongside the orchestra. The performance was conducted by the permanent conductor of the orchestra Gabriela Tardonová. The evening began with a composition named Elegie [Elegy] by Evžen Zámečník, commemorating the legacy of Jan Palach, who deceased in January 1969. The central instrument of the composition is solo violin, which the composer put in opposition to the string orchestra. In an effort at spatial separation of the two elements, the soloist Milan Paľa stood on the balcony behind the audience in the hall. Although this distance had to be an obvious performing disadvantage for the conductor and the violinist, the resulting acoustic effect made you even forget about some minor rhythmic discrepancies heard in the conclusions of some phrases. In addition, Paľa's sophisticated expression managed to counterbalance the strident uniformity of the orchestra. Despite the distance and distinctive disparity of forces, both elements have united into a single musical message and a lively, permanently running dialogue. The transition of the plaintive melody of the solo violin into a roaring dramatic message thus always remained inside the inseparable context of the orchestra, which oppressed the soloist (in a good sense!) but, in spite of that, never managed to defeat him. After Zámečník's Elegy, the orchestra followed up with a composition titled Concentus Biiugis for Piano Four Hands and Strings by Jan Novák. 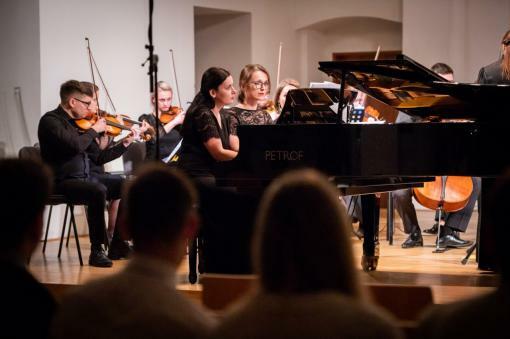 The violin soloist was replaced by pianists Kristýna Znamenáčková and Lucie Pokorná, this time completely traditionally placed in front of the instrumentalists. After the introductory, rather meditative composition, Novák's concerto sounded like a revelation. Thick cadences crowned with predatory and passionate interpretation were a welcome counterpoint to the previous Zámečník's piece. Tardonová was anxious to keep the typical humour and wit of Novák in place, which, despite certain subtlety, leaked through an otherwise serious and ceremonial performance. However, somewhat unhappily, the musicians did not always meet on pizzicatos in the quieter dynamics that stood in contrast with the otherwise superbly managed homophonic parts. We should not forget to mention the excellent interplay of the two pianists, who, in addition to their precise technique, also demonstrated maximum sensibility for various aspects of Novák's composition. While Novák's concerto was written in the heyday of the artist’s creative powers, the composition Tamango for Strings and Timpani by František Gregor Emmert is the first ever orchestral piece of the nowadays already acclaimed native of Brno. 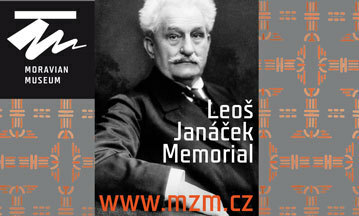 The work itself was written during Emmert's studies at the Janáček Academy of Music and Performing Arts under Jan Kapr. Despite this being a composition by a young composer, it is impossible not to find some elements in it that accompanied Emmert for the rest of his artistic life. Timpanist Lukáš Krejčí represented an organic part of the orchestra, and dramatic stretches with thundering of timpani created, thanks to the conductor Tardonová, a compact and consistent sound. The final composition performed at the close of the evening was a work named Concerto Funebre for Violin and String Orchestra by the oldest of all the featured authors, Karl Amadeus Hartmann. The composition was created as a silent protest against the German occupation of Czechoslovakia in the autumn of 1939. In the introductory part, we can hear quotes from the Hussite chant Kdož sú boží bojovníci [Ye Who Are Warriors of God], through which the composer continues to more ferocious and more escalated musical expressions. The solo violinist Paľa mastered the extremely demanding violin part without the slightest problems, and managed to achieve intonation purity and rhythmic precision even in the most escalated moments. However, in terms of dramaturgy, a better venue could be found for the work. After an excellently arranged programme, this composition at places gave an impression of being excessively violent and sometimes unexpectedly shallow, which seemed to be a step in the wrong direction. The length of the piece might also be to blame. The last concert (for the time being) of the Music Stocktaking cycle of the orchestra Ensemble Opera Diversa offered an intense cross-section of works by prominent Czech authors, who unfortunately appear very sporadically on the stages of music halls. However, this is a burden that the ensemble carries with heads up, contributing thus not only to the legacy of the composers themselves, but especially to the orchestra itself and its own name.